Silvia Tcherassi for Payless has become one of my favorite collaborations. She presents some unique silhouettes and of course we get it at a very affordable price. 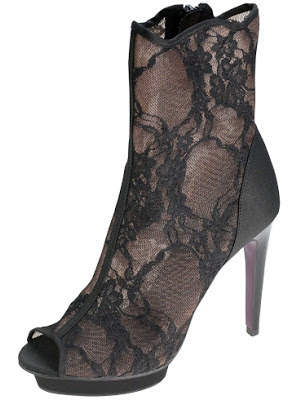 These Silvia Tcherassi for Payless Peep-Toe Lace Ankle Bootie make a great, wallet-friendly alternative to the Dolce & Gabanna Floral Lace & Mesh Peep-toe Boots I featured back in March. They feature a lace upper with sleek satin accents, a scalloped edge at the ankle, and a 4 1/2" heel with 1/2" platform (the Dolce's featured a 4 3/4" heel). And what makes these even better, they are currently on sale for $54.99, so get them while you can.